It was a turning point on his path to his vocation. An event that has made a difference in his life ever since. Archbishop Charles C. Thompson looks back on the unexpected death in the early 1980s of a cousin, only a year older than himself at the time, as the decisive moment that led him to become a seminarian. A college sophomore at the time, Archbishop Thompson had thought about the priesthood ever since his childhood. But it was this life-changing incident that spurred him into action. In a recent interview with The Criterion, Archbishop Thompson reflected on this turning point and the many other steps he has taken in his journey into life and ministry as a priest and now a bishop. The first steps that Archbishop Thompson took on his vocational journey were guided by his parents, Coleman and Joyce Thompson. Their personalities and the way they lived out the faith complemented each other during Archbishop Thompson’s childhood, helping him to grow in the faith from an early age. “It was the combination of my parents that had a great influence on my vocation,” he said. His father, he said, showed him how to apply his faith in service more through his example than by his words, such as when he would work on the cars of his friends and loved ones. “He would never take money when he did someone’s brakes,” Archbishop Thompson remembered. “He would say, ‘You do something for someone else.’ My dad taught me about doing for others and doing not to be paid. His mother helped him learn about the faith, serving for a period as a volunteer catechist in their parish. They also did it with lots of other people—a large extended family who shared his faith in a rural central Kentucky community that was also largely Catholic. His views on the priesthood started to change when he was about 12 and another cousin of his became a seminarian. He is Father Dale Cieslik, a priest of the Archdiocese of Louisville. Around the same time that his cousin became a seminarian, Archbishop Thompson and his family moved to Louisville. He soon became a student at a high school that was marked by violence. A few years later, after his cousin a year older than him had died, Archbishop Thompson finally focused his thoughts on God’s call in his life. He talked about this with his cousin Father Cieslik, who was a transitional deacon at the time. Looking back on his four years at the southern Indiana seminary, Archbishop Thompson remembers learning so much about the faith that he had never known. Archbishop Thompson was ordained a priest for the Louisville Archdiocese on May 30, 1987. Entering into parish ministry, he soon learned that the formation he received in seminary continued after ordination. He had to make adjustments in his life. For example, instead of living with a whole community of men in priestly formation around his own age, he now lived with one other priest who was much older than him. Later, he lived on his own. 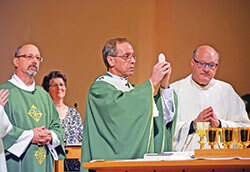 “One of the things that you have to get used to is living alone, the solitude,” Archbishop Thompson said. He also had to change his time for personal prayer. In the seminary, he would do that in the evening. In parishes, that time was filled with many meetings each night. And while prayer in the seminary naturally was focused much on himself and discerning God’s call in his life, prayer in parishes took on a wider scope. Over the course of his 30 years of ordained life and ministry, Archbishop Thompson has been called to serve in a wide variety of contexts: parishes, high schools, canon law and diocesan administration. Those different ways that he’s lived out have helped him grow in ways he never would have expected. “Each one of the particular roles I’ve had—as vicar judicial, vicar general or bishop or high school chaplain or pastor—brought forth gifts that, had I not been in that position, I would have never known was within me to do,” Archbishop Thompson said. “I would have never dreamed I had the capability to be an archbishop.